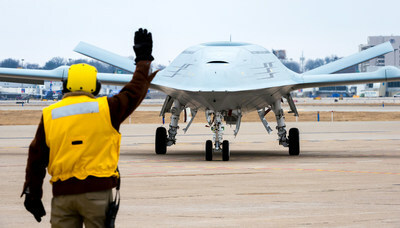 BERWYN, Pa., April 4, 2019 /PRNewswire/ -- Triumph Group (NYSE: TGI) has been awarded a contract by The Boeing Company to supply critical hydraulic system components for the MQ-25 unmanned aerial refueling program. "Triumph Group is proud to be selected by Boeing to support the U.S. Navy's unmanned aerial refueling program and provide a variety of hydraulic subsystems used in the flight controls, landing gear, aerial refueling and arresting systems of the MQ-25," said Frank Dubey, Executive Vice President for Triumph Integrated Systems. "These systems play a critical role in ensuring consistent operational performance of the aircraft to support the mission. We look forward to working with Boeing on the MQ-25 program through to production." Triumph Integrated Systems will provide components for the hydraulic systems used in the landing gear and the aircraft's arresting systems. Integrated Systems provides similar content on other Boeing defense aircraft. The MQ-25 is the U.S. Navy's first operational carrier-based unmanned aircraft and is designed to provide a much-needed refueling capability. The contract supports Boeing's engineering and manufacturing development program to provide four MQ-25 aircraft to the U.S. Navy for Initial Operational Capability by 2024. Triumph Group has been a supplier to Boeing since the company's founding 25 years ago, and many of its businesses have supported the company even longer. This latest contract will help sustain jobs within the Integrated Systems' Fluid Power and Actuation operating company. Triumph Group supplies a wide range of systems, components and complex structures for multiple Boeing defense programs. "The MQ-25 program is vital because it will help the U.S. Navy extend the range of the carrier air wing, and Boeing and our industry team is all-in on delivering this capability," said Dave Bujold, Boeing's MQ-25 program director. "The work we're doing is also foundational for the future of Boeing - where we're building autonomous systems from seabed to space." More information about Triumph can be found on the company's website at www.triumphgroup.com.